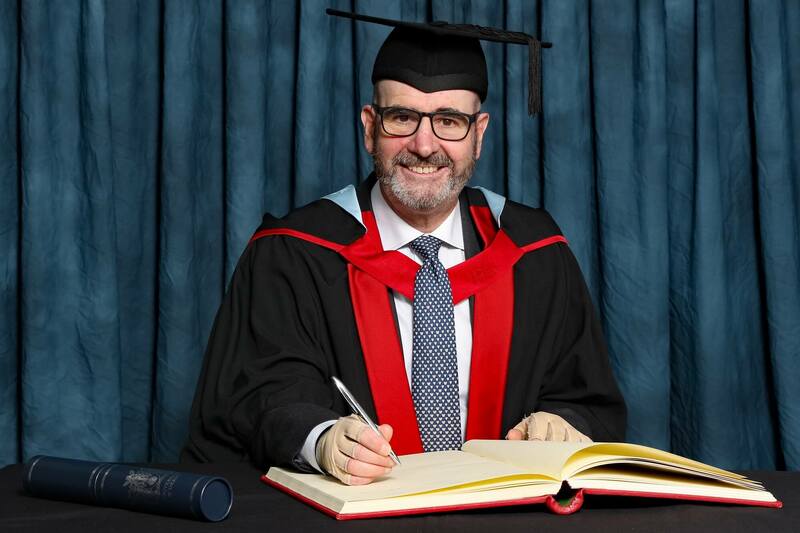 Chancellor, Vice-Chancellor, honoured guests and graduands, it gives me great pleasure to be presenting today Steve Perez, for the award of Honorary Master of Business Administration. Steve is chairman of Global Brands, a leading independent drinks business, and owner of the only four-star independent hotels in Chesterfield, Casa Hotel and Peak Edge Hotel. Steve was born in Chesterfield where his Spanish father ran a pub and restaurant renowned as one of the finest in the area. As a child Steve liked the idea of following in his father’s footsteps and running a restaurant of his own. Failing that, he wanted to become a pop star. He left school just before taking his A-levels and began working in his father’s restaurant as a trainee chef and waiter. Sadly Steve’s father died when Steve was only 19 years old and the family business had to be sold. Steve borrowed some money and started selling imported beers to local pubs from the back of his van. The business grew, but in 1993 the law changed in terms of bringing alcohol into the UK and shortly after the company had to end operations. The drinks industry was in turmoil but, ever the entrepreneur, Steve started buying up bankrupt stock, sold it on, and built up some capital. In 1997 he formed GBL International, with a focus on owning his own brands. He noticed the popularity of ready to drink products such as Hooch and Bacardi Breezer, and spotted a gap in the market for something different – a vodka-based product – and VK was born. VK Vodka proved to be a huge success and the business grew rapidly. It is now one of the best-selling vodka-based drinks in the UK. In 2002, Global Brands was the UK’s fourth fastest growing company and Steve was voted CBI Entrepreneur of the Year. In this last financial year, Global Brands’ turnover reached £42m and Steve is now looking to expand the business further. Aside from his highly successful global drinks business, Steve has also expanded his interests into property, farming and hotels. In late 2010 Steve’s dream of building Chesterfield’s first four-star hotel came to fruition in the form of Casa Hotel. In the same year Casa won the Derbyshire Times’ ‘Most Innovative Building in Chesterfield’ award and in 2015 it was voted fifth best hotel in the UK in Trip Advisor’s Travellers Choice Awards. Last year Steve was able to buy the hotel and restaurant originally set up by his father in the 1960s, The Red Lion and Peak Edge Hotel. The restaurant is now renowned for having one of the most successful food offerings in the area. Steve has a passion for high quality local produce and takes an active interest in the running of his own local organic farm, Walton Lodge Farm. The farm produces almost all of the organically reared meat used in his restaurants. He is passionate about his staff too, and takes great pride in the contribution made by the local people to his business. Outside of work, Steve has been a successful rally driver and is a four-time British rally champion. He has competed all over the world with his Kick Energy rally team. Unfortunately, in June this year, Steve was involved in a serious accident whilst taking part in a rally in Belgium. He received severe burns and was unable to attend the University award ceremony during the summer. Thankfully, due to the excellent treatment he received in hospital in Ghent, he is back on track to making a full recovery. Steve is clearly a man of enviable drive, energy and entrepreneurialism. His dynamism comes from wanting to be the best at what he does. Chancellor, in recognition of his achievements as a local entrepreneur and his impact on the local economy, we are delighted to award Steve Perez the honorary degree of Master of Business Administration.